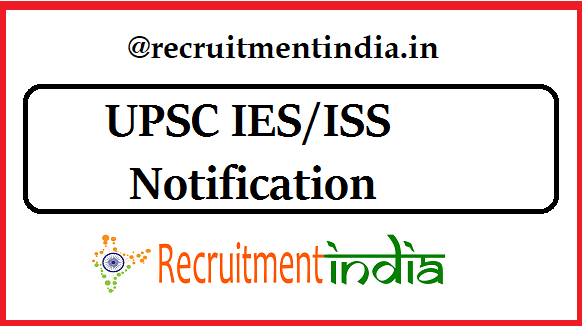 UPSC IES & ISS Exam 2019 Notification is rolled out for 65 IES/ISS Vacancies of Indian Economic Service, Indian Statistical Service posts at the official website of [email protected] upsconline.nic.in. the officials are inviting the eligible candidates from 20th March 2019 to 16th April 2019. On the basis of Post-Graduate Degree and Master’s degree candidates are applicable for UPSC IES/ISS 2019 Application registrations. Follow this article for getting more information. UPSC, New Delhi – Hello welcome back job hub of Recruitment-India. Today’s announcement is about the UPSC IES/ISS 2019 notification on two different field jobs of Indian Economic Service, Indian Statistical Service posts . The unit has very recently updated the completed details regarding of the 65 IES/ISS Vacancy in UPSC which is currently updated on the internet and going viral from 20th March 2019. Eligible seekers should have to apply the UPSC IES & ISS Exam 2019 Notification within the dates of registration by utilizing this amazing chance Check out more Central Govt jobs 2019 at here. As per the latest update of Union Public Service Commission, the unit was rolled out the UPSC IES/ISS Exam 2019 notification. In this article for the latest IES/ISS Vacancy of Indian Economic Service, Indian Statistical Service posts of UPSC are informed. The Central Govt is willing to recruit the new candidates for these vacancies via a UPSC Recruitment Cell and This is organized by the UPSC Central Department of New Delhi. From 20th March 2019 onwards, the registrations have started to apply online. Eligible seekers should apply now. The total details of Eligibility criteria are provided in the below section. Depositing the money in any Branch of SBI by cash or by using net banking facility of State Bank of India or by using Visa/Master/RuPay Credit/Debit Card with the help of the SBI Branch on the next working day only on or before the payment last date. On Behalf of the Central Govt of India, the UPSC New Delhi will be going to organize the UPSC IES & ISS Exam 2018-19 after the applications received. The registration of upsc.gov.in IES/ISS Application Form has started from 20th March to 16th April 2019. Job Seekers should have to remember that the 16th April 2019 is the last date to apply in online for 65 IES and ISS posts Notification at the official website of Union Public Service Commission @ upsconline.nic.in. The unit is going to releasing the Exam Admit Cards in the month of April 2019 after completely checking the submitted UPSC IES/ISS 2019 Online Form @upsconline.nic.in. Apply UPSC IES & ISS 2019 [email protected] @ upsconline.nic.in., the seekers have to get the awareness about the selection process of UPSC Exam for Indian Economic Service, Indian Statistical Service why because the officials are going to recruit the suitable candidates through the Written Examination and Interview/Personality Test rounds in this recruitment cell. Under the age relaxation of 21 to 30 years of aged persons are only allowed to register the details in the UPSC IES/ISS Online Application Form 2019 in online and to participate in this recruitment cell. Totally UPSC 65 IES/ISS Vacancy are going to be filling now. Check out more details in the official notification. Please, visit official website @ upsconline.nic.in., then later hunt for main UPSC IES & ISS Exam 2019 Notification as well as registration forms and download them. Afterward, fill up the blanks with correct details as per the requirements. Submit the click button & take a hard copy. Enroll your names within the due date mentioned in the notification.